Ruby Cardel has grown up with a part of her life missing. It's the year her sister, Jamie, died and she's seemed to move on from trying to regain any memory back. Yet, when she learns that Jamie's death wasn't actually an accident, Ruby is desperate to unlock her childhood again. Ruby decides to go back home, to Lyrebird Hill, where it all started. Only what she discovers is a tale of family history and secrets that might have been better left alone. 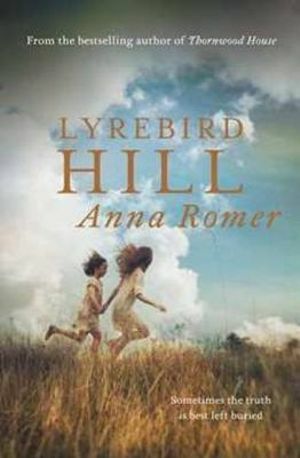 I'm in two minds about Lyrebird Hill. I'm actually a massive fan of mysteries, especially when they revolve around family history, so whilst I was interested in the premise of this, I felt like it didn't really engage me as much. I really liked Anna Romer's writing, the way she painted the perfect scenery for the story to exist in. It's set in Australia and she portrayed the growth of a rural area from the late 1890s to the present day in such a realistic manner, whilst also not losing that refreshing and rugged feel of the outback. The novel is told in a dual perspective, bouncing from the present to the past, but it's easy to decipher the different narrators through their voices. I found that it was really easy to read despite it's size, gliding through the pages, although I wasn't devouring it as I thought I would. Romer's writing also drew out realistic physical descriptions of the characters, in really unusual ways. I found that I could definitely see the characters after only a few sentences. Yet, I didn't really grow attached to any of them. I certainly felt for Ruby and Brenna - the other narrator - with their saddening and traumatising experiences, but there wasn't a lot that was relatable. In fact, it felt like Romer only skimmed the surface of these characters. There was so much more that could've been drawn out from these characters, especially Brenna. Her character had more complexity in terms of addressing the issue around Indigenous Australians during the 1800s. That was definitely a great theme to explore, but it wasn't impactful or thought provoking, which I would've liked to have seen. The mystery itself was interesting in its revelation. Ruby's memories burst through in moments and it's like she's fallen back into time. I'm not sure every moment was as realistic, even during Brenna's "days", but I looked past that because you never know really. I was caught by surprise at the end, when everything came together, and for those last moments I was fully engrossed. The ending was sweet and satisfying. I wouldn't say this was the best family mystery novel I've read, but it definitely has a more unique tone. I just felt at some points it was a little dry. I still have a few questions regarding the connections between Brenna and Ruby, and how it was suppose to add to the story and other things, but it's nothing major. On the whole though it was an enjoyable read though, and you might like it better than me!